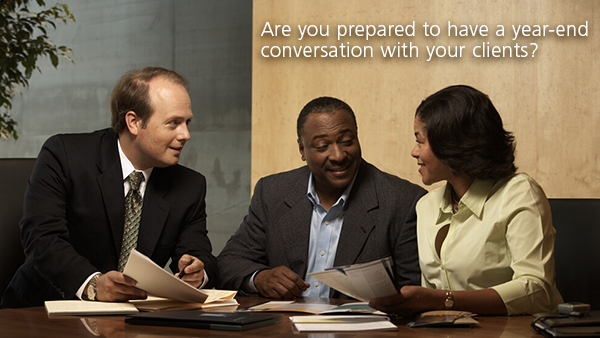 Are you prepared to have a year-end conversation with your clients? At another time of the year, a casual question about one’s day may bring a nod of recognition or perhaps a shrug. At year-end when your client asks, “How am I doing?” investment performance and market conditions are usually behind the inquiry of whether a portfolio is up or down. Year-end niceties can be your opening for a deeper conversation with clients about concepts that are important to long-term wealth creation and preservation. Clients tend to focus on the short term when a long-term investment discipline has traditionally led to better performance. Financial Advisors must strive to control the agenda and to keep their investors focused on portfolio risks and not solely on returns. No one can control returns, but you can help clients control the level of risk and the extent of hedges owned. Begin by focusing your client on year-over-year “portfolio performance.” Do not dive into the winners and losers right away but emphasize the important truth of portfolio value. Then begin to examine the account for clear winners that are now outside of their targeted allocation range. Note: If a portfolio does not have any winners, it may not be diversified. Note: If a portfolio does not have any losers, it may not be diversified. Private equity and private debt strategies? Opportunities in Global Macro trends? Precious metals and currency strategies? Continue to examine the portfolio with an open mind to the investable universe. In today’s world new products are arriving and delivering upon old investment concepts that have not normally been available to individual investors. Is there additional capital your client wants to consolidate and put to work? Are there winners that should be pared and placed into new asset classes? Is it time to position assets for long-term growth, or perhaps consider opportunities in illiquid investments that might meet income and growth goals? Look at risks that may be coming. Do you have investments in the portfolio that could perform well in a rising-rate environment? Are there investments in the portfolio that may perform well if the investor’s domestic currency is challenged? If volatility returns to the equity markets, are there good shorts in the portfolio? And, of course, match these new ideas with your client’s goals and current needs. Alternative investments may involve higher fees, more limited liquidity, and greater risks, including higher volatility and the opportunity for significant losses, compared to traditional investment strategies. Alternative investments are not suitable for all investors. Behringer creates, manages and distributes specialized investments through a multi-manager approach that presents unique options for allocating capital, managing risk, and diversifying assets. Investments sponsored and managed by the Behringer group of companies have invested into more than $11 billion in assets. For more information, call toll-free 866.655.3600 or visit behringerinvestments.com. Past performance is neither indicative nor a guarantee of future results.